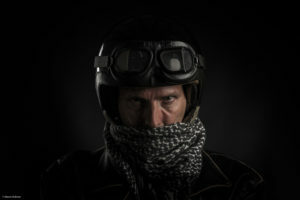 Together with Saskia from Flitsendbeeld I did a very cool biker shoot in the studio. 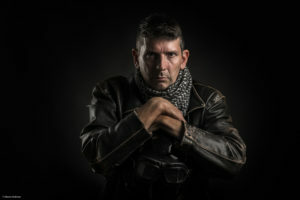 We had Santiago in the studio with his biker outfit and accessoires. 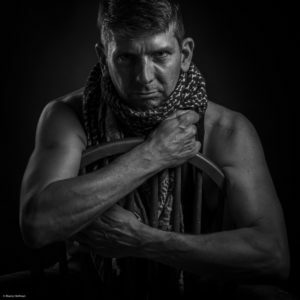 We went for a moody and grunge look and created some cool images. Santiago is working on a very interesting project with electric motorcycles. Check out his Facebook page Aalten gaat Elektrisch. 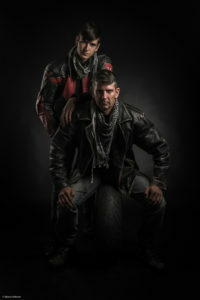 Santiago brought his son Tycho to the shoot as well and we also did an image of them together. With a pretty cool family portrait as a result. At the end we did a smoke session and used a spotlight to replicate a motorcycle’s headlight through the mist of the motorcycles ‘burn-out’ (aka slipping and smoking rear wheel). We used a studio strobe with a small octabox as the main light. In the back we had a strobe with a strip box to create the rim light. On the background we had a strobe with a standard reflector and a grid. 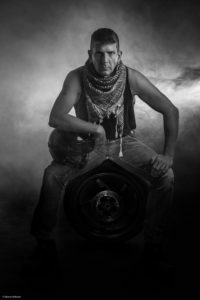 For the smokey image we used the same octabox as a main light. And a strobe with a gridded reflector and barn doors in the rear for the ‘headlight’. We added an extra strobe with a standard reflector and grid at the lowest power to light the wheel. So thank you Santiago and Tycho for being such great models. You both did a great job.